Gujarati White Sandwich Dhokla is a delicious farsan from the state of Gujarat. Dhokla has different varieties and form like Khaman Dhokla, White Dhokla, Khatta Dhokla. Gujarati White Sandwich Dhokla is a delicious farsan from the state of Gujarat. Dhokla has different varieties and form like Khaman Dhokla, White Dhokla, Khatta Dhokla. This delicious Dhokla is made with White Dhokla using Rice and Urad dal flour and Green Coriander Chutney is sandwiched between two layers of White Dhokla. 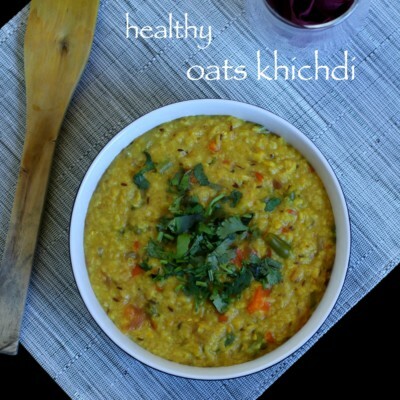 This is very easy recipe and if followed nicely it will give delicious results! The batter for this recipe is fermented for 5-6 hours or overnight for making the Dhokla. 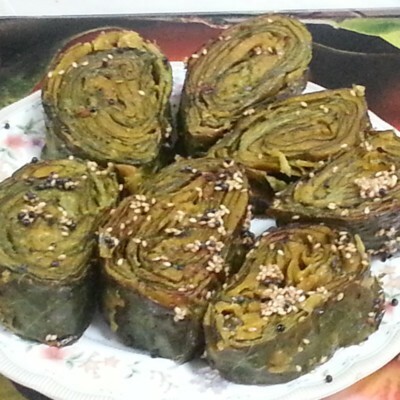 Sandwich Dhokla is spicy variant of famous Gujarati snacks Dhokla. 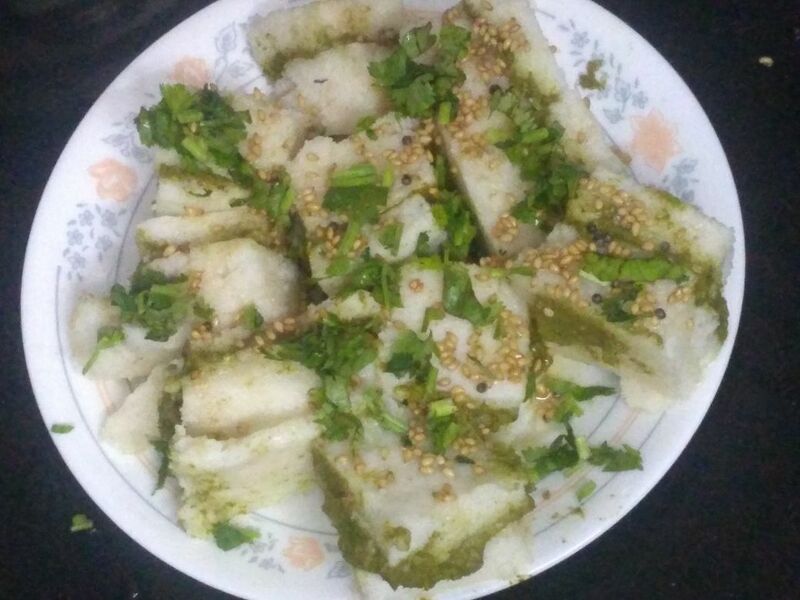 Sandwich dhokla is spicer version of White Dhokla, made from rice and udad dal. In this recipe, chutney is used in between two white dhokla or two different types of dhoklas. You can try with combination of white and yellow dhoklas or your own creations. Preparing Sandwich Dhokla is as easy as other dhoklas. 1. In a grinding jar mix Rice Flour, Urad Dal Flour and Curd. Now add water and grind to a smooth paste. If required add more water. 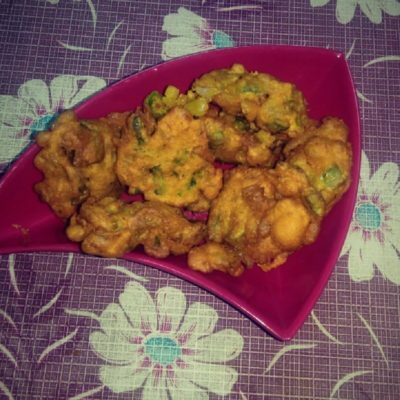 The paste should be free flowing and similar to Pakora Batter. 2. Remove the batter in a bowl and leave it covered in a warm dark place for 5-6 hours or overnight. 3. 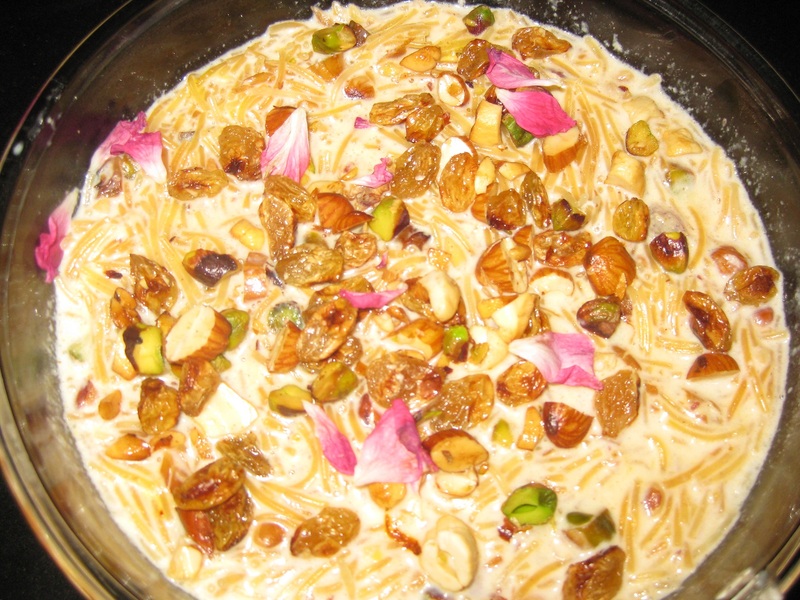 Check if the batter is fermented by tapping the bowl. It should feel light. Mix the batter thoroughly. 4. Add Green Chillies and Ginger Paste, Salt and Oil to the batter and mix well. 5. Add Eno Fruit Salt and mix well. Put half of the batter in a Greased Dhokla Plate and spreak evenly. Tap the Dhokla Plate gently to spread evenly and remove any air bubbles. 6. 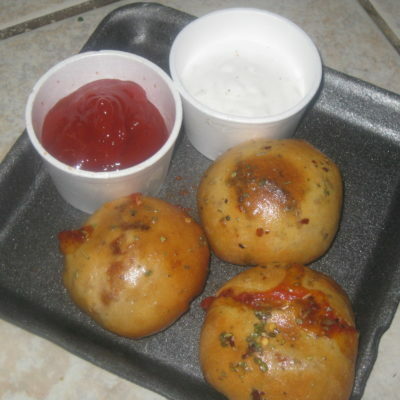 Steam in hot Idli Steamer for 5-7 min. 7. After 5-7 min check the Dhokla and it should be firm. Spread Coriander Chutney evenly over the Dhokla using spoon. 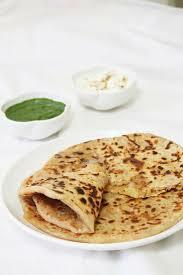 You may increase or decrease the quantity of Chutney as per taste. 8. Pour remaining batter over the Plate evenly covering the sides. Tap gently. Sprinkle Coarsely ground Black Pepper. Steam for 10-12 min. 9. Once done take out the Dhokla Plate and let it cool completely. 10. Now for the tempering heat Oil on high in a pan and add Mustard Seeds. Allow it to crackle. 11. Switch off the flame and add Cumin Seeds, Curry Leaves and Slit Green Chillies. 12. Cut the Dhokla in Square or Diamond Shapes and spread the tempering evenly over it. Garnish with Freshly Chopped Coriander Leaves. 13. Remove the pieces in a plate. Delicious Sandwich Dhokla is ready to serve!